I liked this one a lot. Dean's one-liners were fantastic, all the way through. "If it isn't the famous Winchesters..."
"If it isn't some random demon"
I chuckled so many times in this one. Plotwise, the "heist" was fun. The new demon was fine, but Luther was a great character. 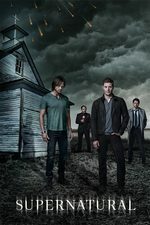 Great episode that mostly stands on its own, but still has relevance and implications for the larger arc, which is what Supernatural did best in the early days. They keep introducing characters who seem interesting enough that you figure they're gonna stick around for a while... only for those characters to promptly die. Both Shrike and the crossroads demon had some oomph and I was kind of of amazed they didn't last the episode. On the one hand it's sad to see interesting characters go so soon, but on the other hand it speaks well of the show that even the one-offs are intriguing enough that you'd like to see more of them. Even "Grab" didn't seem like your standard issue demon. If he'd stuck around maybe he would have revealed himself to be as evil as any of them, but from what we saw he just seemed like more of a shifty wiseass. I can see "Smash" coming back, or not. The bros could use some allies, these days. I thought they'd be using the alt universe as an excuse for lots of dead characters to come back, but so far it's been pretty light. We haven't seen Bobby nearly as much as I expected! I can see "Smash" coming back, or not. The bros could use some allies, these days. Maybe it's just because she fits the demographic and the CW's casting style but I sorta figured she was gonna wind up being another "Wayward sister" for the spin-off. Which would be fine with me, she's definitely got more potential to mine. Didn't even think she might be a potential spinoff character! Would she be the right age, though? I gather the spinoff will be about teens and she seemed more twentysomething to me. That aside I can see her as the quirky brains of the outfit. Yeah, even if she isn't a regular I could definitely see a role for her being kind of the Bobby of the new show. I was all "Oh, I like Alice! She's so awesome with her flowery boots, so she's probably going to die by the end of the episode." I was happy she made it and I liked that she got to be the one to free herself from Shrike (which I knew was his name because we watch with closed captions, but damn if it didn't sound like they were saying Shrek). I feel so dumb, because I'm pretty sure they WERE calling him Shrek as a joke but somehow I wasn't making the connection to Shrike and I just kept looking at the guy and trying to figure out what was Shrek-like about him. I doubt Shrike will come back, but I suppose he could. Even if he was off his property, it's not hard to come up with reasons why a magic-using immortal might survive having his head cut off. I was glad Smash survived. But I'm not holding out hope for her to pop back up again. Gee, I wonder if that half of the spell will somehow be used in a haphazard way that will endanger the world. I can't say I liked the episode as well as the poster did. Mostly I thought it was pretty dumb, what with the "oops we set the spell on fire" bit. What did I like? The aforementioned "random demon" quote, the ribbing about watching "Entrapment," followed by them just merrily sending the immortal guy down the hallway to take all the darts. That part was great.